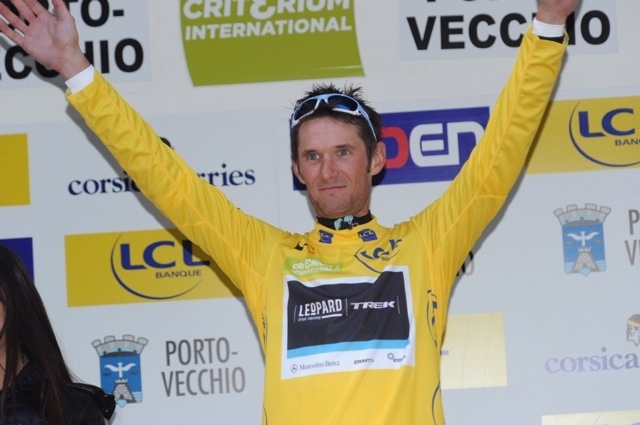 Frank Schleck cemented Leopard-Trek’s great day at the races, winning the opening stage of the 2011 Criterium International to match team-mate Fabian Cancellara’s win at E3 Prijs in Belgium. Like Cancellara, Schleck launched a solo attack to take the win, the Luxembourger’s first of the season. The mountainous stage played to Schleck’s strengths, with a mountain-top finish on Corsica’s Col de l’Ospedale. His rivals had no answer as he attacked in the final 2km. Vasili Kiryienka (Movistar) came home in second, 16 seconds behind Schleck, with Rein Taaramae (Cofidis) third at 22 seconds. Schleck wears the yellow leader’s jersey going into Sunday’s final two stages – a short morning road stage followed by a 7km individual time trial in the afternoon. Last year British riders Russell Downing (Sky) and David Millar (Garmin) scored stage wins in the final day. Frenchman Pierrick Fedrigo won overall.